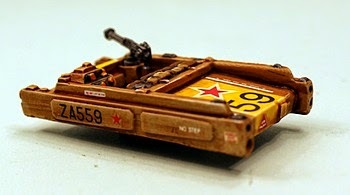 Welcome fan of 15mm.co.uk and customer of one of the greatest collections of 15mm scale miniatures in the world. Its been a good year for us with a scattering of releases and surprises that saw us continue to grow and to do excellent things that make people happy. Top among these were HOF27 Maginot Defence Turret and V106 Law Officer Air Raft for 15mm science fiction, HOT3T Troll Value Pack and the Tabletop Dungeon Adventurers packs for 15mm Fantasy and the Altuos 15mm Renaissance range for 15mm Historicals. In our range of book titles we sold out of a whole print run of Age of Might and Steel. We also saw a really awesome surge in the SHMP20 Prang Bosses pack designed by Eli Arndt. Not seen these? Click the links and have a look. Before we begin in earnest with the awesome I want to tell you all about this festive season for us. As you might know 15mm.co.uk is one part of a bigger family that also includes the mighty www.alternative-armies.com and the rapidly growing www.theionage.com. Its been a busy year for us; increasingly so. In fact we have all been working six or even six and a half days a week since the late summer and now we have taken on more staff too. We have experienced a surge in demand for everything that we make from miniatures in 15mm scale to miniatures in 28mm scale as well as resin vehicles and terrain, pro-painted miniatures and armies and also books. As a result we had been a little behind on shipping out orders (normally we ship our four or five days week). We are taking a break for a few days for Christmas and the seasonal closure of the freight companies and the post office but deliveries will commence once more as soon as things return to normal. Let me take this chance to thank you all for your support this year and always. 2015 is going to be an epic year and for 15mm.co.uk it begins now....read on. We have four pieces of news for you that concern the coming weeks. From 24th December through 25th December and during 26th December this code will get you 15% off everything on the website. Enter code 'fifteen' as it appears here (without the ' ') during the checkout process on page two of the process (that is after you enter your payment details) on same page page as your postage choice in the DISCOUNT box and your product total will automatically reduce 15% on screen. This applies to all miniatures, all books, all vehicles, all pro-painted, all army packs. The code will work for these three days only. For full details on using codes see the last part of this PAGE on our website. On Tuesday 6th January 2015 the Festive Range will be taken down and shelved until winter 2015. 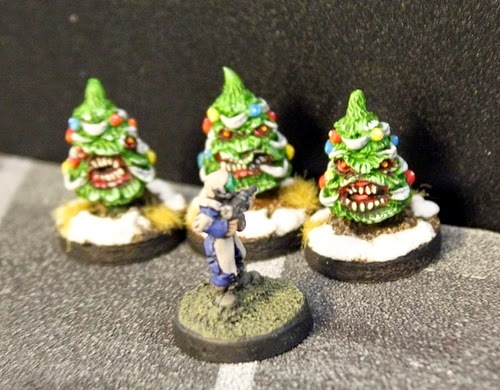 So if you want to purchase the SN01 Evil Snowmen and or the SN02 Killer Xmas Trees you have until then. When the range returns it is our intention to expand it again with another code as we did this season. Go to the Deals and Offers page until 06.01.15. From Monday 12th January 2015 until Monday 19th January 2015 we will remove the postage for standard UK and International Airmail and replace them with FREE SHIPPING on all orders. Place an order as normal and select free postage during checkout and there you go! This applies to all orders of all values and as many orders as you like worldwide. We are planning a major expansion of our HOT 15mm Fantasy Range next year with more than a dozen new packs and a part of this is the creation of new Monsters, Creatures and Behemoth codes. We are going to ask for our customers input in this directly. Almost all the releases in our HOT range are based on wargamers requests but this is a new thing for us to ask directly. We will make the top FOUR creatures a miniature reality in 2015. So if you are not on our Mailchimp list email us on sales@15mm.co.uk asking to be put on it. The survey will be sent out in January 2015 and all you will need to do is read it and then reply with your choices. So now that you know what is coming make your notes and your choices and plan your campaigns a new for the next season. Will it be festive before they leave for another year or will it be a saving off normal prices or will it be that most rare of things now...free shipping worldwide? Lastly there will be no further posts on our blog until January next year but we will be issuing reminders by email and on social media such as our Facebook page. So as we say here in Scotland “Hae yersel a merry Christmas an a guid new Year”!!! See you all 2015! What a hoot we had last week with the free USEME micro scenario Cold Thing with hundreds of you checking out the Malamute Mercenaries and their struggle with the snow made men. You can see and download this scenario HERE if you missed it. So this week its the second of the linked scenarios and this time its Killer Xmas Trees in a lobby no one will forget. Branch Face - A scenario for two players or solo play. Out of the frying pan and into the...forest. A diminished group of Malamute Mercenaries find themselves inside the AH Station in a lobby filled with trees...trees that have teeth and will bite back! 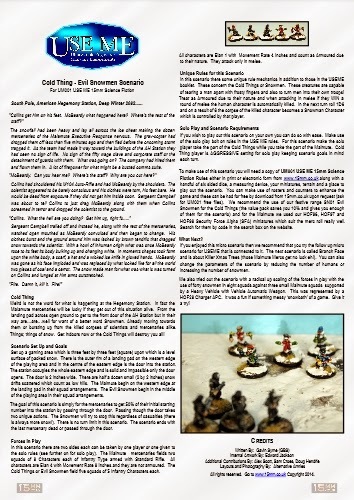 CLICK HERE to download the scenario from our dropbox account for free as a PDF to your computer or device. Its easy and great fun and will only need a handful of miniatures some dice and about half an hour of your time. Excellent! You can find the festive range on our Deals and Offers page until early January 2015. You can find the whole USEME System on its own page. We used UM001 USEME 15mm Science Fiction for this scenario. Galactic Knights to be expanded in 2015! 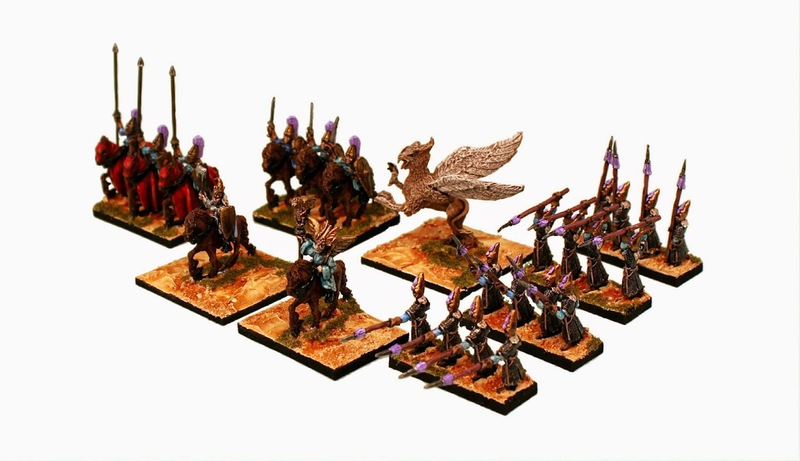 Back in the middle of November 2014 I put up a blog post announcing that 15mm.co.uk was very near to the five hundred packs sold that would lead to the expansion of HOF105 Galactic Knights by another two or so pack codes in 2015. If you missed this posting CLICK HERE to read it before continuing. Got it? Good. The response to the possible expansion was really nice with a lot of comments, emails and messages coming back to us with suggestions and other ideas based on the list of possible packs I had outlined from customers and gamers who had already been in touch. The goal of five hundred packs was passed and so we move onto the expansion. So what was the winning suggestion? Well it turned out that the logic in the initial post was pretty much spot on with the most requested codes being a command pack with four poses and a support pack with four poses allowing the creation of a whole force or platoon of Galactic Knights. Coming in behind those two was a light vehicle such as a bike and also the creation of characters to lead a force. Running a long way behind were a dozen asks for a pack of 'Ultragaranians' the enemy of the Galactic Knights which is interesting as I have no idea who or what they are! We have therefore committed to two more HOF pack codes for the Galactic Knights with a total of eight new poses from Command and Support. A few of the suggestions were a little outlandish to be sure. These included a comic book series, a video segment and a series of 54mm scale miniatures along with t-shirts and also some 'suggestive drawings' based on the female knight in the existing artwork. None of these were ever going to happen to be honest but we might do a t-shirt in the future as a limited run. You never know. 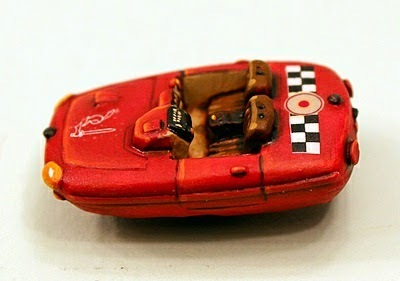 There will be news on this blog once the miniatures are made. This will be in the first quarter of 2015. 2015...the far future...is now. 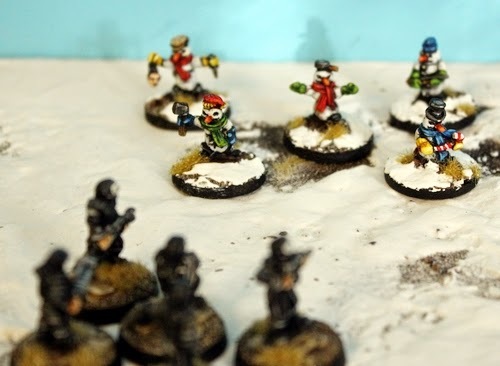 Following up on the re-release of the Terminus micro scenarios for USEME and also the bringing back of the festive range Evil Snowmen and the new Killer Xmas Trees we present the first of two winter themed scenarios. This is our last offer at 15mm.co.uk until Xmas Eve and our three day special (watch our blog for this one on the 24th December) and its being run upon one of the true legendary ranges of 15mm miniatures; Laserburn. 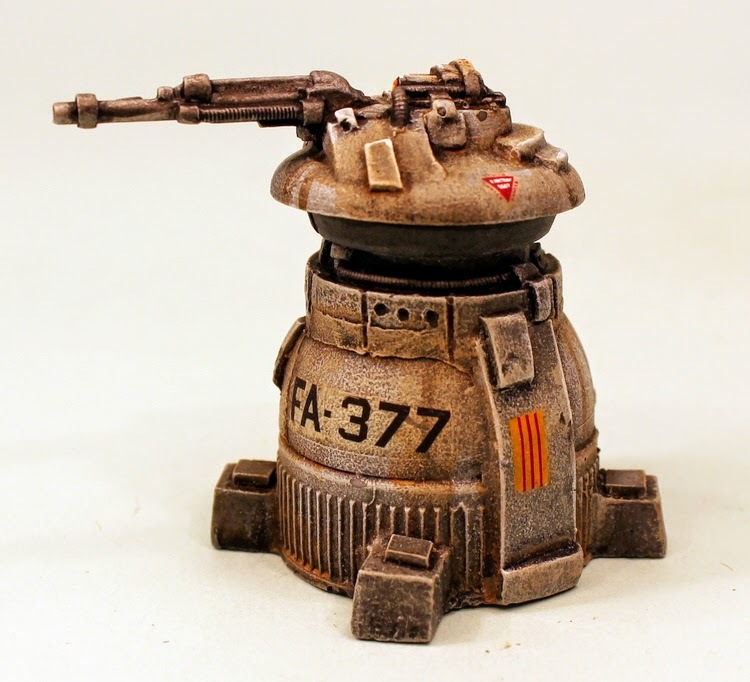 Classic 15mm scale science fiction that is very popular the world over due to its big selection of military, civilians, aliens, robots along with vehicles that just buzzes with possibilities. A lot to choose from. You can find Laserburn HERE. Here is our festive Laserburn offer. From now until the 23rd of December if you purchase ANY item from the Laserburn range, from one miniature, one vehicle, one gun turret or book up to an order of any size we will put automatically and free into your order one V101 Flit Car worth 1.50GBP. Excellent! But there is more. If you have have at least one Laserburn Value Pack (LB01 to LB20 codes) in your order as well then we will ALSO place a free V104 Hover Support Wagon worth 4.00GBP into your order. Brilliant! You need do nothing but order and we will add the free items on your behalf. We will continue to ship out orders right up to the closing of the UK post offices but essentially you need to get your orders in during this week and into next week to ensure they arrive with you in most cases. But if not then it will be soon afterwards that the package arrives. We will also continue mailing packages into the new year. Free Cadaver Giant with any HOTT 2nd Edition Army! We have a long connection with Hordes of the Things (HOTT) and 15mm.co.uk has some twenty different popular HOTT 2nd Edition 24AP Army Packs. 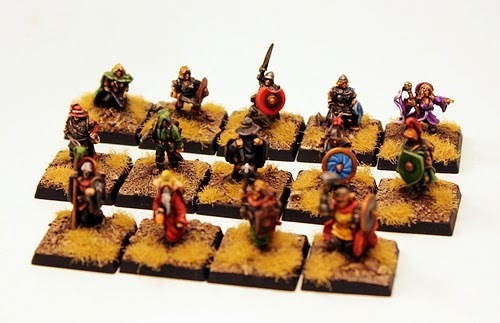 Each of these packs contains all the needed miniatures from our HOT 15mm Fantasy or Tabletop 15mm Fantasy ranges along with all needed element bases in the correct sizes and an assembly guide as well. You can see all of these army packs HERE. We also offer every one of these HOTT 24AP Armies painted and based ready for use right out of the gates. These are at a great price and we always try to keep them in stock. You can select the painted and based option by clicking on the 'choose your miniatures' box on the product page and you can see the great tabletop quality you will get in the pictures on the page. As its the festive season we always make a number of releases and offers as well as free materials and content too. 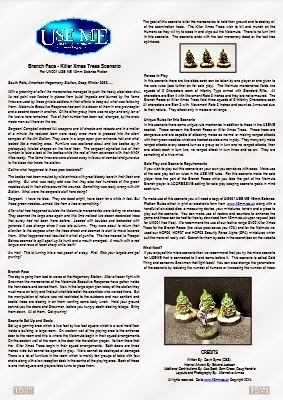 You might have seen our release of the SN02 Killer Xmas Trees last week or yesterday the putting online of the six Terminus scenarios for USEME for free for example. This is our festive fantasy offer. If you purchase any HOTT 2nd Edition Army from 15mm.co.uk during December we will automatically put a HOT55 Cadaver Giant (worth 4.00GBP) free in your order! You need do nothing as we will add the monster for you and if you purchase a painted and based army then your free HOT55 will be painted and based as a behemoth too. Excellent! 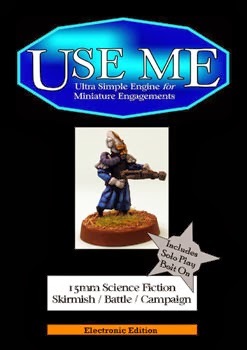 Nearly three years ago I wrote half a dozen scenarios for use with USEME or more especially for use with UM001 USEME 15mm Science Fiction rules system. This was during the time that USEME was literally tearing up the world with near five thousand copies sold globally and before 15mm.co.uk had a blog or other non website online presence. 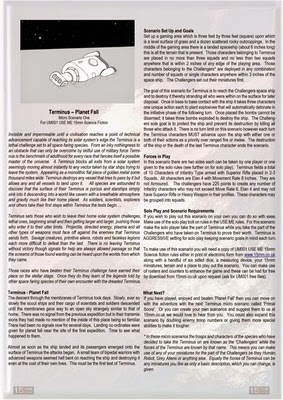 These linked scenarios were in an arc called 'Terminus' and were archetype scenarios dealing with a scouting mission to an unknown alien construct. Good for playing to learn or playing again or taking and adapting. We emailed them out hundreds of times. But we never put them online for free download... Now we have! You can download the six scenarios in one PDF (3mb in size) from our Dropbox account for free by clicking HERE. These are simple scenarios and are presented as such. The pictures in the Terminus scenarios were drawn by Flintloque artist Edward Jackson and the in play photos are from my own wargaming and testing of the mechanics. We do hope you enjoy this free download and it was put up off the back of requests to 15mm.co.uk. If you have not got a copy of USEME you can find the whole series in PRINT on our website and if you prefer to purchase a PDF version then they are hosted on our blog. Just follow the links. UMS01 Danger on Outpost 32 - Complete Starter Set with rule book, scenario sheets, miniatures, bases and dice! HERE. UMS02 Ziggurat of Clem IV - Complete Starter Set with rule book, scenario sheets, miniatures, bases and dice! HERE.